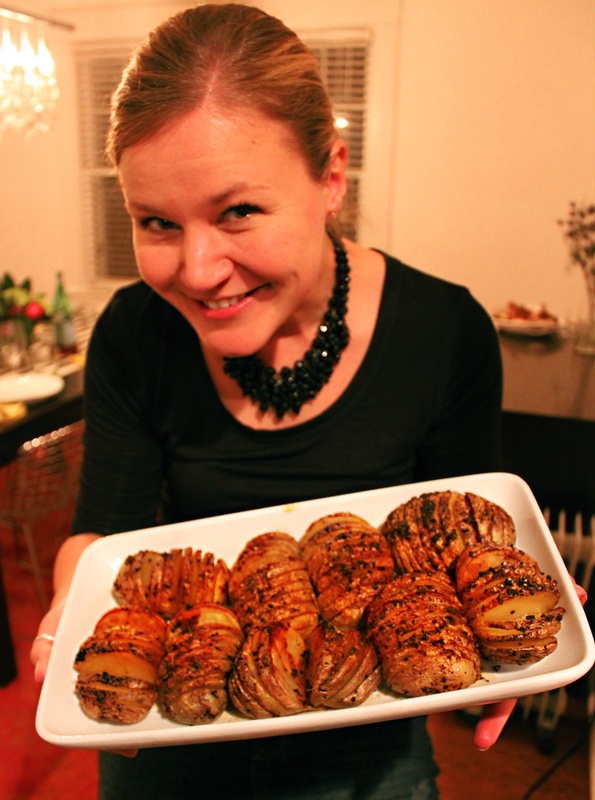 My Smoked Paprika and Garlic Hasselback Potatoes were a big hit of the “just because it’s cold dinner party.” And, the hot oven helped keep the kitchen warm. I’ve recently become very interested in incorporating smoked paprika into my cooking. For so long I judged plan old paprika – it was often lonely on a deviled egg or just used for color. But smoked paprika comes in sweet, hot, bittersweet and even sweet and spicy varieties! Check out Savory Spice Shop at Friendly Center for a complete run down and shopping spree. Smoked paprika is now landing itself on a simple grilled salmon, on top of hot popcorn or on these most delightful hasselback potatoes. The flavor is subtle but superb. Check it out and Enjoy! Heat the oven to 425°F . Cut slits in the potatoes, leaving the bottom intact: Cut slits into the potato, stopping just before you cut through so that the slices stay connected at the bottom of the potato. Space the slices 1/8-inch to 1/4-inch apart. In the meantime, heat oil, butter, garlic, salt, pepper and smoked paprika in a small sauce pan until melted and aromatic. Arrange the potatoes in a baking dish. Brush the potatoes all over with butter mixture. Sprinkle with a touch more salt and pepper. Bake 30 minutes, then brush with butter again. Bake the potatoes for about 30 more minutes. Once the potatoes are crispy on the outside and tender inside, serve them hot!